Slickdeals News & Articles News Does Buying In Bulk at Costco Actually Save You Money? Does Buying In Bulk at Costco Actually Save You Money? You could be saving big at Costco... but only if you're shopping smart. While in the Costco checkout line last month (with a packed-to-the-gills shopping cart in tow), the cashier told me it was that time of year again -- my membership had expired. Shelling out the $55 annual fee always prompts me to ask my husband one question: "Does shopping at Costco actually save us money?" His answer is always a resounding yes, but I wasn't totally convinced. So I decided to do some serious digging into the whole buying-in-bulk thing. If you've been thinking of getting a Costco membership (or considering ditching your current one), you'll want to see what I found. I started by zeroing in first on the membership fees. Costco offers two membership options for regular shoppers: the basic Gold Star Membership and the Executive Membership. The upgraded Executive Membership comes in at double the price of the basic membership with a $110 annual fee, but it also has some additional perks. The biggest draw is a reward certificate given to you at the end of each membership year worth 2% back on pretty much all of your Costco purchases. According to MarketWatch, the upgraded membership fee pays for itself if you spend roughly $230 a month over the course of the year. 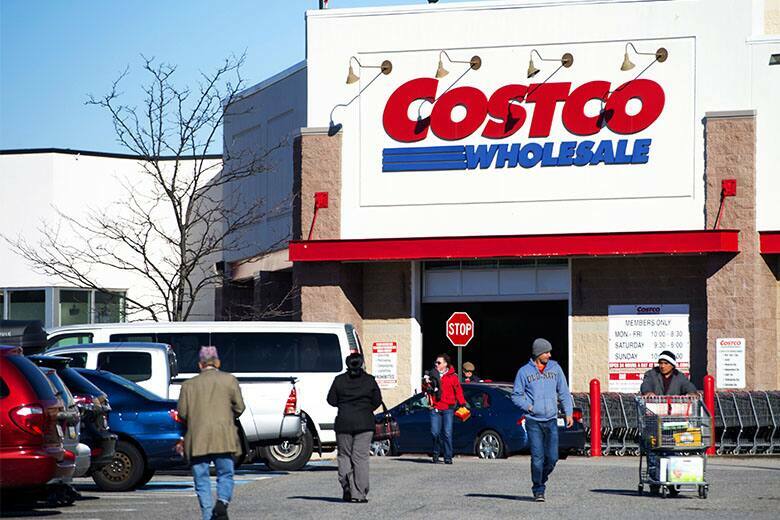 You can reap even more rewards with Citi's Costco Anywhere Visa Card. It also doles out 2% cash back on all Costco purchases, along with 4% back on gas, 3% back on restaurants and eligible travel purchases, and 1% back on all other purchases. In our house, we opt for the bare-bones membership and pay using cash or our debit card, but when I started actually crunching the numbers, it became clear that my husband was right -- shopping at Costco definitely saves us money, even without the 2% back of an upgraded membership. Turns out, it's actually quite a bit. Our approach is simple: We buy all of our grocery staples at Costco. Things like meats, coffee, paper towels, and toilet paper all fall under this category. Doing a price comparison with our local Publix grocery store easily shows why this is worth it. Below is a side-by-side price comparison between my local Costco and Publix, purchasing store brands at both places whenever possible. When I subtract the $55 membership fee, Costco still ends up saving our family more than $650 per year. Paper towels were the only item that came out a bit cheaper at Publix, but in this case, you get what you pay for. We've tried the Publix store brand before and found them to be less absorbent than the Kirkland brand. Going into Costco without a list is a sure-fire way to go over budget. "The way that you get sucked into spending a ton of money, and the way that I need to be mindful personally, is by the impulse buys," says thrifty lifestyle blogger Rachel Teodoro. "I still won't walk down the center aisles of Costco, or even the outside area where they've got all of the office supplies and home DIY stuff because all of a sudden I feel like I need six full-size rugs and 23 throw pillows." Costco knows how to tempt you. Every time you go there, it's raining free samples. While there's no shame in making a lunch of Costco samples, don't let them lure you into purchasing things you don't need. A lot of people are unaware of Costco's price protection policy, which is pretty solid. If you purchase something that ends up going on sale with 30 days, Costco will refund you the difference if you have your receipt. Do you really need a gallon of mayo? Costco is all about ginormous packaging, which is why I rarely pick up anything perishable there. (I individually freeze all the meats we buy.) On more than one occasion, I've had to throw away packages of rotten fruit, expired snack bars and the like, simply because we couldn't eat it fast enough. Unless you have a huge family or you're throwing a party, opt for items that either have a long shelf life or can be frozen. Costco offers a whole slew of discounted gift cards and tickets, from local movie theaters to five-star restaurants. Stocking up on a few makes for great go-to gifts for friends and family. A great example is this Universal Studios Hollywood Annual Pass, on sale for $109.99. On the Universal Studios website, the cheapest available price is $129. Since Costco indeed sells huge portions, it can be tricky to compare prices with your local supermarket, but I promise it's worth it. To start, always double check the price-per-unit if it's listed since that's the easiest way to compare costs. Additionally, check the weekly grocery store circulars for better deals. For example, I always buy laundry detergent at Publix. Why? They run BOGO deals all the time, which ends up saving me money in the long run. It's all about paying attention. Shopping around is especially important when it comes to big-ticket purchases. Those amazing deals that pop up occasionally for things like TVs or appliances may be for low quality models or lesser-known brands. Teodoro learned this the hard way when she went through Costco to buy new tires. "Tires seemed like a way better deal at Costco, but in the long run, it ended up being a really poor decision for us to purchase tires there," she says, adding that they ended up having to be replaced sooner than anticipated. Even so, she says that Costco is still a go-to destination for her family of five. Does buying in bulk save you money? Share your shopping hacks in the comments below! And don't forget to check Costco's February coupon book for additional savings opportunities.